“Views from the Driveway” takes readers on a series of sojourns, from time traveling to the pre-MTV days when life was less electronically connected to exploring Italy's stark and captivating Abruzzo region. Writer Amy Barone reveals some of Italy's secrets and the safety in embracing conflict. 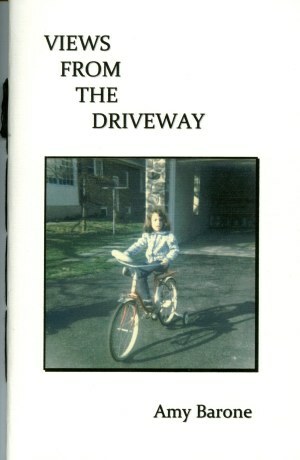 Her poems were inspired by recollections of growing up in suburban Philadelphia, nights hanging out with musician friends, and the haunting redemption of dreams. A native of Bryn Mawr, Pennsylvania, Amy Barone has lived in New York City since 1999 where she works as director of communications for HealthCorps, an innovative health educational program. She spent five years as an Italian correspondent in Milan for Women's Wear Daily and Advertising Age. Her monthly column, “Postcard from New York,” appears on Italian lifestyle website www.beauty.it and she participates in monthly poetry readings at the Cornelia Street Café in New York City as a member of the Italian American Writers Association. Amy's poetry has appeared in Gradiva, Wild Violet, Philadelphia Poets, The Pink Chameleon, and several PoetWorks Press anthologies, among other publications. She received a Bachelor of Science degree in Business Administration from Villanova University and a Masters in International Management from the Thunderbird School in Glendale, Arizona, subsequently discovering that writing embodies her true passion.